Love omelette? 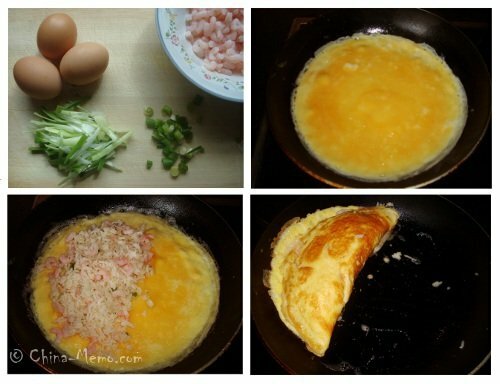 Why not try this Chinese omelette, fluffy egg with prawn and fried rice. A fun experiment and really easy to make, so hopefully you can get the idea from it and make your own version. In China the egg fried rice is quite normal as family meal. We also have the dish using the egg to wrap the stuff inside then fried afterwards, which we usually call it egg dumpling. In fact, such egg dumpling can be considered as a small version of omelette. 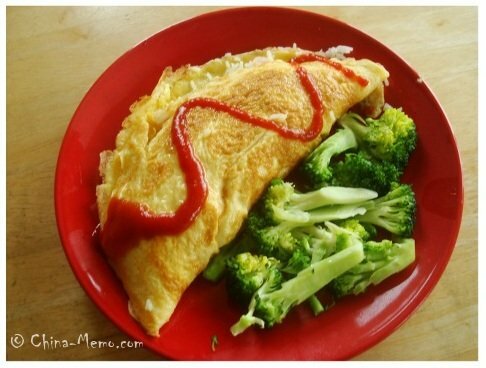 This Chinese omelette was inspired by the Japanese version egg wrapped rice (dan bao fan 蛋包饭). Just for an experiment and it turns out to be quite easy to make. Hope you like it. In a medium bowl, whisk together egg with salt and pepper. Heat a frying pan or wok over a high heat, add oil. Then add cold cooked rice and fry few minutes till the rice is well separated. Add the prawn. If you like, you may also add some green peas or chopped sausages (like this fried rice recipe), seasoning with salt and pepper if you like. Once cooked, transfer to a plate and set aside. Heat a frying pan or wok over a medium-high heat. Add oil and swirl the pan to coat the base and side. Add the beaten egg and tilt the pan to spread the mixture across the entire pan base. Once the egg begins to set, add cooked rice and prawn over one side of the omelette. Carefully fold the other side of the omelette over the fillings. If needed, you may use some left beaten egg to seal the gap. Finish with the ketchup on top. Place on a plate and serve with other vegetables. When fry rice, make sure to use the cold cooked rice. Otherwise, the fried rice will be sticky. Prawn does not need to cook long, otherwise it will loose the tenderness and moist. Make sure use the medium high heat to make omelette; otherwise it might be burnt. Well, that’s it, easy, right? 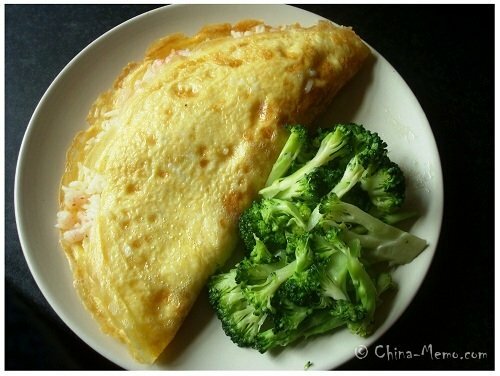 I hope you will like this Chinese omelette recipe. Be free to share with your friends as well. For more egg recipe, you may see this egg fried rice with green peas and prawn or Chinese style microwave cooked egg.